Easy, multiperson remote conferencing anytime, anywhere. Integrating the Projectphone with a Web conference system, you can easily hold conferences with remote locations anytime, anywhere. 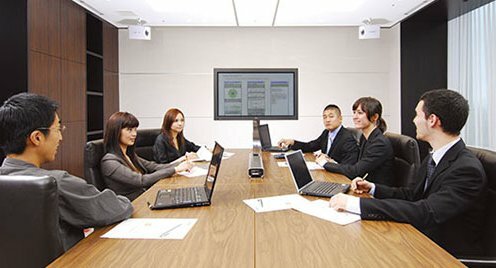 This instantly eliminates the inconvenience of fixed video conference rooms that require reservations and scheduling. Given the increased importance of work coordination when team members are spread across multiple locations, business productivity can be dramatically increased through real-time information sharing and communication. Reduces time spent moving between business venues and makes business trips more productive. By setting up a remote conference system that combines Web conferencing with the Projectphone, it is now possible to resolve issues and complete tasks in a Web conference that previously demanded a business trip. You can now reduce time spent moving between business venues, and increase effective working hours. Of course, Web conferencing will never completely take the place of face-to-face interaction, but if details can be worked out in a Web conference before in-person meetings, you can reduce the number of such meetings while increasing their productivity. Also, business trips sometimes involve a large number of people because talks often cannot progress without all of the principle parties. One solution is to send one person to the meeting and have the principles appear via Web conference only when necessary. This cuts down on the frequency of business trips, improves efficiency, and raises productivity. Compact, lightweight, and easy to carry anywhere. The PJP-25UR conceals itself neatly in a B5-size laptop bag, and weighs a mere 570 grams. With its portable size, you can even join Web conferences while out on business trips. Or, you can create a smooth, hands-free working environment in a home office by combining the PJP with a softphone or Web conference system. Reduces travel, personnel, and other expenses. By introducing Web conferencing and the Projectphone into your company, business trip expenses (including related incidental and latent costs) are significantly reduced. Environmentally responsible companies are placing priority on CO2 reductions. When business trip frequency is lowered through Web conferencing and the Projectphone, the amount of CO2 emitted through transportation is also greatly reduced. Thus, the PJP not only increases business efficiency and cuts travel costs, it also makes a significant contribution to reducing CO2 emissions. Utilize the PJP as an effective backup tool for your phone line, and for remote conferencing when trouble occurs. I am curious as to what would be the market size for a light weight, web-based document management system - geared towards individual users and small to medium sized businesses. A web based document management system that offers scanning, sharing, cheap storage of documents and other hard-copy files?